The story follows Jimmy Hopkins, a teenager who�s been expelled from every school he�s ever attended. 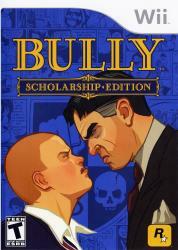 Left to fend for himself after his mother abandons him at Bullworth to go on her fifth honeymoon, Jimmy has a whole year at Bullworth ahead of him, working his way up the social ladder of this demented institution of supposed learning, standing up for what he thinks is right and taking on the liars, cheats and snobs who are the most popular members of the student body and faculty. If Jimmy can survive the school year and outsmart his rivals, he could rule the school.